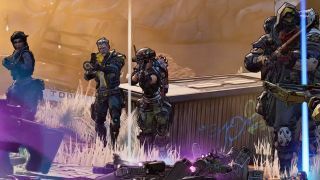 Five long years after Borderlands: The Pre-Sequel was released, Gearbox is finally ready to debut its next game in the series, dropping the first full trailer for Borderlands 3 at a Penny Arcade Expo (PAX) keynote event. We know based on the trailer that the game will be in 4K and feature many of the same crew members, enemies and allies from our first three trips to Pandora – including a gargantuan Tiny Tina, for some reason. The trailer was introduced by Gearbox’s CEO Randy Pitchford, who also treated the audience to a live magic trick while unveiling the series’ first board game crossover, Borderlands: Tiny Tina’s Robot Tea Party, as well as 4K remasterings of the first three games before stumbling on some technical difficulties. After a few misfires, however, we got our first look at the game, which we've included for you below. The trailer doesn’t tell us exactly where the game will be set (Borderlands 2 ends by unveiling a star map with new vaults on planets across the galaxy) but it does give us a feel for what kind of environments and vehicles we can expect when the game comes out, including two new massive city locations and a ridiculous unibike bristling with guns and rockets. That said, in spite of some new changes to environments and vehicles, the game still looks like the same old Borderlands in terms of gameplay. There’s looting, there’s shooting, and there are a ton of powers for just three minutes of trailer footage. Also a sweet saxophone solo and a walking gun. Plenty to look forward to. There’s no release date set for Borderlands 3 just yet, but it’s likely we’ll hear more about the game at E3 2019 in June.